Need a Professional Electrician in Vancouver? We firmly believe that your home electrical needs to be practical & flexible to suit your lifestyle requirements. Our mission is to provide peace-of-mind and comfort through quality installations with family-like customer service. Skilled Vancouver electricians doing great work – with family-like customer service and integrity. 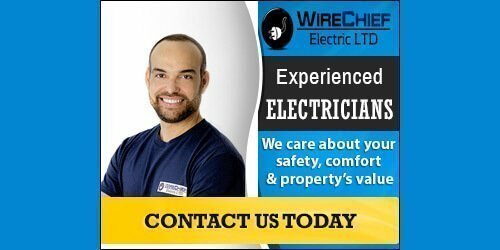 WireChief Electric Ltd. is your trusted first choice for an experienced and reliable greater Vancouver electrician. We specialize in electrical installation & repairs throughout Vancouver, Burnaby, Coquitlam, West Vancouver, North Vancouver, Port Moody, New Westminster & expanding areas. Hiring a qualified, licensed Vancouver electrician to inspect your home, make repairs, and conduct installations is a smart way to protect your home’s value and safety. We are a 100% locally owned and operated provider of quality electrical services to residential customers in Greater Vancouver area. Our strength lies in our attention to detail, friendly customer service, quality workmanship and the ability to develop long-term relationships with our clients. When working on minor home electrical repairs and minor home electrical installations, call WireChief Electric Ltd. We can save you time, money, and a massive headache when dealing with seemingly simple electrical tasks. We know you can do it…but can you do it safely, on time, and not make anyone mad in the process? We can help you look like the pro. Even if we’re busy, we return phone calls. We are always reachable. We respect our client’s time and feel that it is important to be punctual for all scheduled appointments. We are dependable and we deliver what we promise. We provide everything according to the terms of our contract and complete the job as scheduled. Up Front Guaranteed Pricing – you know the price before the work begins. We take pride in our work and we are passionate about what we do. Our passion and outstanding workmanship are reflected in every project. Our electricians will treat you with courtesy. Our electricians will treat your home with respect. Our trained electricians will wear shoe protectors over their boots and use drop cloths to cover your floor and furniture. Our electricians will leave your home clean, if not cleaner then when we arrive.